Liverpool's Luis Suarez has been handed an eight-match ban and a £40,000 fine by the Football Association after being found guilty of racially abusing Manchester United's Patrice Evra. The statement below was released by Liverpool following the verdict. "Liverpool Football Club is very surprised and disappointed with the decision of the Football Association commission to find Luis Suarez guilty of the charges against him. "We look forward to the publication of the commission's judgment. We will study the detailed reasons of the commission once they become available, but reserve our right to appeal or take any other course of action we feel appropriate with regards to this situation. "We find it extraordinary that Luis can be found guilty on the word of Patrice Evra alone when no-one else on the field of play - including Evra's own Manchester United team-mates and all the match officials - heard the alleged conversation between the two players in a crowded Kop goalmouth while a corner kick was about to be taken. "The club takes extremely seriously the fight against all forms of discrimination and has a long and successful track record in work relating to anti-racist activity and social inclusion. We remain committed to this ideal and equality for all, irrespective of a person's background. "LFC considers racism in any form to be unacceptable - without compromise. 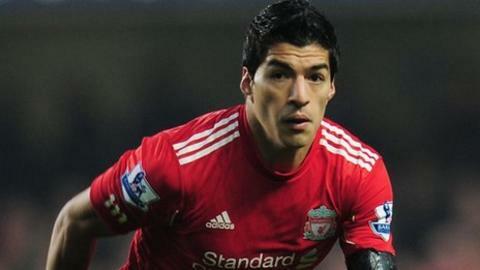 It is our strong held belief, having gone over the facts of the case, that Luis Suarez did not commit any racist act. It is also our opinion that the accusation by this particular player was not credible - certainly no more credible than his prior unfounded accusations. "It is key to note that Patrice Evra himself in his written statement in this case said: "I don't think that Luis Suarez is racist." The FA in their opening remarks accepted that Luis Suarez was not racist. "Luis himself is of a mixed race family background as his grandfather was black. He has been personally involved since the 2010 World Cup in a charitable project which uses sport to encourage solidarity amongst people of different backgrounds with the central theme that the colour of a person's skin does not matter; they can all play together as a team. "He has played with black players and mixed with their families whilst with the Uruguay national side and was captain at Ajax Amsterdam of a team with a proud multi-cultural profile, many of whom became good friends. "It seems incredible to us that a player of mixed heritage should be accused and found guilty in the way he has based on the evidence presented. We do not recognise the way in which Luis Suarez has been characterised. "It appears to us that the FA were determined to bring charges against Luis Suarez, even before interviewing him at the beginning of November. Nothing we have heard in the course of the hearing has changed our view that Luis Suarez is innocent of the charges brought against him and we will provide Luis with whatever support he now needs to clear his name. "We would also like to know when the FA intend to charge Patrice Evra with making abusive remarks to an opponent after he admitted himself in his evidence to insulting Luis Suarez in Spanish in the most objectionable of terms. Luis, to his credit, actually told the FA he had not heard the insult."